Kara escapes heartbreak by travelling to Nepal; by Lori Lipsky. When friends and family asked why she would quit her job in the States to move across the world where she didn't know a soul, she told everyone it was for the adventure. In part, she spoke truth. Kara did love adventure, but the real reason she quit her job - a successful position for a growing computer software company - was to flee the pain of a broken relationship. Her boyfriend of three years ended things between them, and she'd been devastated. Kara couldn't face the questions of well-meaning friends and acquaintances. How could she grieve the loss of the man she loved when someone mentioned his name to her every day? She gave notice at the job she loved and travelled alone from her home in the Midwest to the Asian country of Nepal. After landing at the airport in Kathmandu, Kara rode in a tiny cab to her designated training location. Because of her height she found it necessary to hunch over in the back seat the entire ride. She held her hands over her head to shield it, hoping to avoid a concussion as she and the driver travelled the bumpy roads. As she crouched in the rear of the tiny cab, she recalled a conversation with her mother only three weeks before. "Forgive my tone, but you cannot be serious. If you tried, I'm quite certain you could find a place to run to that's closer to home than Nepal. You don't know a soul there. I'll be worried sick. Have you considered Disney World? Or Yellowstone? "It'll be okay, Mom. I'm probably only going for a few months. I need to clear my head. And I've always dreamed of seeing Mount Everest. You know that. I'm actually excited. I'll be checking off two or three bucket-list items with one plane ticket." "One open-ended plane ticket. I'd feel so much better if you had a return date planned or if you knew someone in Nepal. You don't know the language. You've never even been there before, Kara!" "That's the point. I want to add another country to my list. It'll be okay. I've learned a few essential phrases, and you know how quick I can pick things up. There'll be other English-speaking teachers at the school, too. I'll get to know them. I want to leave my options open in case I fall in love with the place. I'll have the freedom to see how things go and decide from there." Kara enjoyed the two days of sightseeing in Kathmandu sponsored by the agency. The director of the organization served as guide. After two short days of team-building tourism, her official training started. With her affinity for languages, Kara picked up common Nepali phrases quickly. Then, just two weeks later with training completed, Kara and another teacher loaded themselves and their bags on a bus and headed toward their new home in Parbatipur (pronounced Para-bata-pur). Remote was the term the director used. Kara only knew she loved the scenery as she gazed out the bus window. She loved the view of mountain range in the distance. 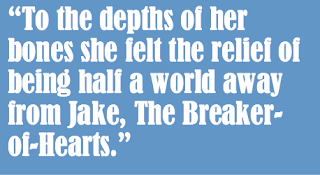 To the depths of her bones she felt the relief of being half a world away from Jake, The Breaker-of-Hearts. Shannon, a twenty-year-old college student from Vancouver, and six years younger than Kara, was on a year-long break from school to teach in Nepal. The two now shared a bedroom on the second floor in the home of their host family. The house was situated on the main street in town above an office space owned and rented out by the family. At dinner the first night, Kara found to her great pleasure she could hold a conversation with her host, Didi (older sister). Didi knew some English. Combined with gestures and the Nepali Kara had picked up, they were able to communicate while Shannon sat dumb-founded until Kara translated the Nepali parts for her. The questions came fast. Where are you from? What is your age? What is your husband's name? You are not married? You are twenty-six and not married? Why aren't you married? We will invite my nephew over for dinner. He is not married either. Hello. What is your name? Where are you from? What is your age? Are you married? You have no husband? You are not married? You are twenty-six and not married? Why aren't you married? Children of all ages, whether she and Shannon were walking down the street or biking, would stop and greet the two white women. Kara felt like all eyes were on her every moment. Her height and her blonde hair drew even more attention than Shannon received. Shannon stood a mere five-foot two inches tall and wore her brunette hair in a short cut. Spectacle was the word for it. Kara was a spectacle at five-foot ten inches with her long blonde hair. Kids ran up to her: Chocolate? Chocolate? Do you have any chocolate? Kids rode their bikes and stopped in front of her with a greeting: Hello. What is your name? Where are you from? Australia? Are you married? Why not? How old are you? With the passion she had for travel, the young woman was not new to being alone internationally, but she had never been asked if she was from Australia before. Germany, Norway and Sweden, but never Australia. And she had never been asked her marital status so often, either. What is your father's name? Are you married? Do you have any sisters or brothers? Is your sister married? How old is she? The older ladies of the small Nepali town often gathered on porches in the afternoon to visit. As Kara walked home at the end of the day, after teaching at the English School, the women she passed on her walk home would flag her down. Namaste, Namaste, Bahini (younger sister). You're pretty. Hello, what is your name? Are you married? How old are you? See that man over there? See? Handsome. And I have a son who is not married. One evening, after almost four months in the country, Kara stood upstairs in the bathroom taking a quick shower. Young girls in the school loved to touch and style her blonde hair with their unwashed hands during outdoor recess. This was her first shower in a week. Water warmed by the sun and pumped by the generator from her host family's well ran over her body. The sun had been out all day so the water felt refreshingly warm. It was her first warm shower in a while, and she was eager to experience the feel of clean hair again. Kara decided that night it was time to return to her family. She knew she'd been prepared now to face the questions that would come her way back in the States. She'd flown all the way to Nepal for daily rehearsals. Are you married? Why not? She'd answered those two questions dozens of times here. The questions and their intent no longer held their power to crush. And besides, she was eager to return home where she could take a long, warm shower every day if she chose. What a luxury that would be. I love a story with a twist! This is brilliant. Thanks! I appreciate your kind comment, Robin. Thanks for reading my story, Joanie! An interesting, well-crafted, compact story, with just the right balance of information and forward progression of the narrative to work perfectly. I appreciate your encouragement, Gareth. Thank you for reading and taking the time to comment. A very informative and interesting story. I wish it had been longer. It seems to me that Kara and Shannon could have a future in other stories. Thank you, Mike. I appreciate your idea to keep the characters in mind for a future story or two. I love this author's crisp writing, fresh like a sun-dried white cotton sheet hanging on an outside line. Your comment has warmed me in the midst of the cold winter weather here in the Midwest, USA. Nice choice of details drew me in. I don’t know if the author has visited Nepal, but she was able to write as if she has. Nice twist at the end, as others have noted, resonated with the title. It doesn't happen often for me, but the title came first with this story. Thank you for reading and commenting, Dave. This was fun! I didn’t see where it was headed but by the third ‘why you not married?’ I knew the author was taking us someplace new. And when the matchmaking began I was laughing out loud. Not just good writing, but an original and engaging perspective from this storyteller! I'm glad the story provided a laugh or two. Thanks, Anita. I really enjoyed this story, good writing, funny and I loved the details about Nepal. It felt real, authentic. I like experiencing new places through stories. Thanks!